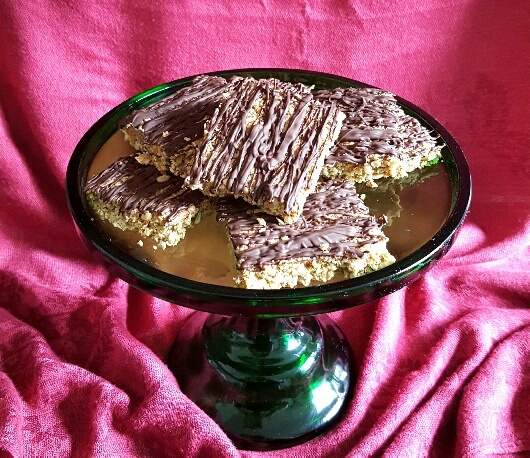 I made Anzac Biscuits a wee while ago and, although they were lovely, they were the thickness of a flapjack and I wanted to make these dark chocolate and ginger oaties thinner so that they were more like a biscuit. 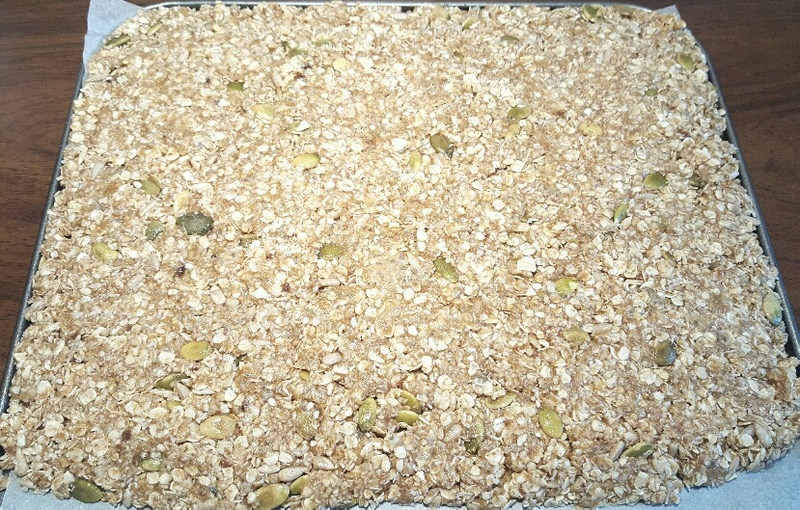 Oats are very FODMAP friendly and most people love baked oats, so it made sense to me to base a biscuit recipe on them. Oats are really good for the body. They’re a great source of protein and fibre and are full of vitamins and minerals, such as iron, B vitamins, calcium, magnesium and zinc. Oats are also excellent for helping to lower levels of bad cholesterol in the blood due to their soluble fibre content, thus reducing the risk of heart disease. They’re all round good guys, really. Although I’ve just written about how healthy oats are, I must confess that aside from my morning bowl of porridge, I really love oats baked as biscuits. There’s something about the flavour of a toasted oat that lends itself well to being incorporated within a crunchy little sweet biscuit. 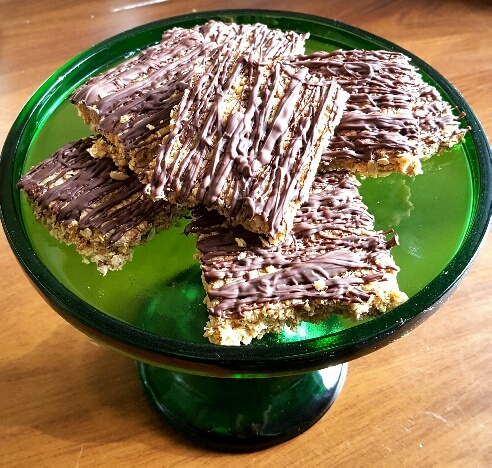 They also have the wonderful ability to complement the flavour of certain spices, such as cinnamon and cardamon, but none more so than within these dark chocolate and ginger oaties. One oatie is a low FODMAP portion. 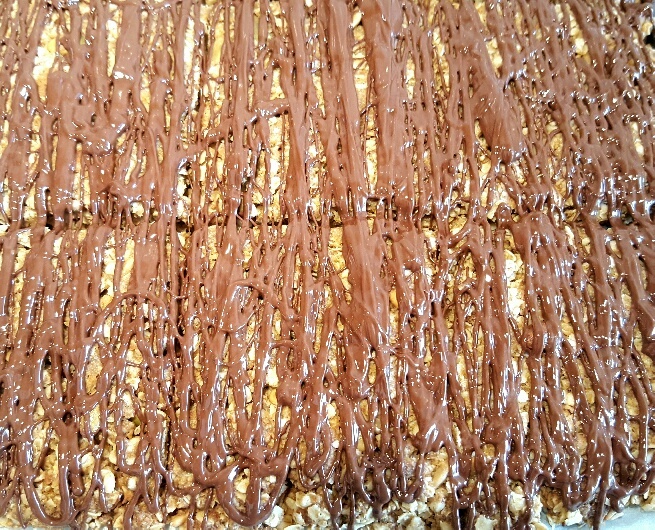 These dark chocolate and ginger oaties are crisp and sweet, but with the added deep flavour profile of the dark chocolate drizzle on top. They’re unbelievably easy and quick to make and keep in the biscuit tin for at least a week, if not more. It all depends on how much you can resist their tempting call. Remove from the oven and, in the case of the individual biscuits, leave to cool. If you’ve made one large bake, then leave it in the baking tray , but cut it into squares while it’s still warm. Once your oaties have cooled down a bit, melt the dark chocolate (I just do this in the microwave, but I stir it very frequently so that the chocolate doesn’t burn). Drizzle over the oaties and leave to set. Wait until the biscuits are totally cold before removing from the baking tray .